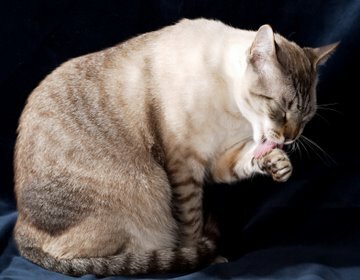 This section on house cat care has been put together to help you (whether you own Siamese, other breeds or moggies) to keep all the felines in your house healthy, happy and purring. New cats in the house? "Help! How much do I really know about taking care of cats?" Don't worry. Help is at hand. We'll have you acting like an expert in no time. We'll teach you the most important things you need to know about looking after cats, answer your questions and give you our tips on domestic cat care. Easy! OK - perhaps not always easy, but it isn't too difficult either. All felines have the same general needs. And a whole lot of love! From working out how much you'll need to spend, through advice on how to look after, feed, groom, and bath your house cats, or give your kitten the best start in life, the answers are here. This Lynx Point can take care of himself! Cat costs - how much does it cost to keep a cat? One-off and ongoing expenses that you'll need to bear in mind before embarking on life with a new feline friend. Thinking of getting a kitten? Just got one? Don't really know what to do? These basic cat care tips will help you take care of your new pet. Most of them are none too keen on water. But if you really, really, need to - this is all about bathing cats. Clipping cats' claws takes patience and skill and is generally done by a vet, but you can learn to do it yourself. Anyone who has indoor cats will soon discover how much they enjoy working off their excess energy by leaping all over your furniture! To stop this happening, a friend of mine, Leyla, did a lot of research into possible solutions and decided to put her findings to good use by turning them into a website, Leaping Cats. You can see the result of Leyla's research into cat trees and other cat furniture here. To find out which plants you need to avoid having around the house, take a look at plants poisonous to cats. Forewarned is forearmed, and a little preparation can save you a lot of heartache. The senior years can bring problems if you're not careful. Older cat care will teach you how to avoid them and look after your best buddy as he moves into the later stages of his life. The articles above should have given you some food for thought and ideas for keeping your new furballs safe, loved and happy. But if you'd like to know more, why not pop over to Our Happy Cat, which has all sorts of great information on house cat care, health and other kitty-related things.